The Fonden Papers Part VI: More information, the numbers still don’t add up! As I noted in the next to last post, there is now more information on the website of Fonden on the details of the projects funded. After spending a day looking at “tools” that would allow me to manipulate the data, I gave up. 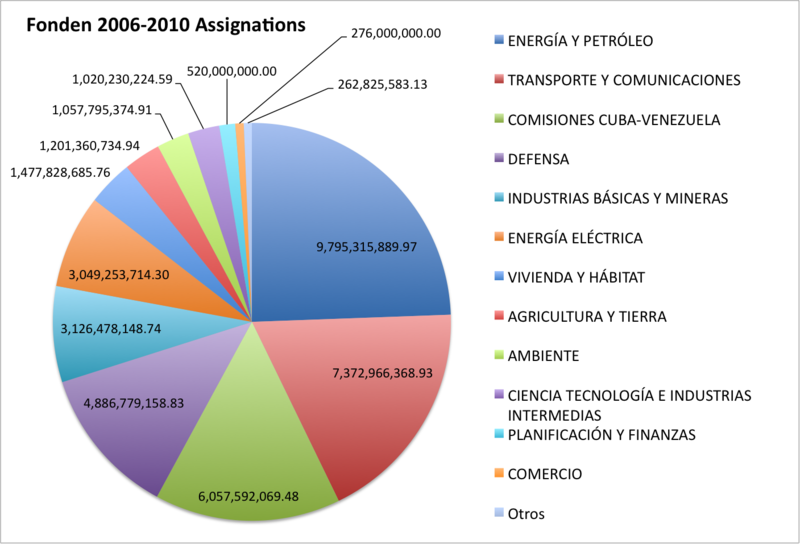 So, I began doing the task by brute force, I went to “Todos Los Proyectos” above and copied project by project into an Excel spreadsheet, hoping to find some of the “missing” US$ 29 billion or so. You can find the Excel spreadsheet here. All of the projects added up to September 6th. 2011 on the webpage of Fonden add up to only US$ 27.22 billion, far from the US$ 69 billion of the earlier report to the National Assembly. US$ 38.158 billion, some US$ 30 billion short (Still!) of the US$ 69 billion the fund has received and the total provided by the Finance Ministry to the National Assembly. Thus, all the work did not yield much, except that by doing it brute force, I read every single project in the website in detail and will have more to say about them later. For now, we still have some US$ 29 billion “Unaccounted for” based on the information provided to the National Assembly, as well as combining the projects in the Fonden website on Sept. 6th. 2011 plus those missing from it in the report to the Assembly. This entry was posted on	September 7, 2011 at 9:36 pm	and is filed under The Fonden Papers, Uncategorized, Venezuela. It would be nice to have the info on disbursed funds versus assigned, but if it is too much work, it is not worth it. Is there anything that you still want to retrieve from those docs or you have it all? I can go through the data this Sunday, adapt my tools and retrieve the information missing. 1.- Thanks, sometimes things work out sometimes they don’t, I think this has gone well, but I am left with this feeling that we need a little push from…God, Buddha, karma, or someone to get this thing nailed. 2.-Life is like that, I have the opposite, sitting tight here for longer than I can remember for the next five weeks. And I am stubborn as hell. 3.- Haven’t had time to compare in detail the “old” stuff and the website, would love it if you looked at it, at this time I have lots of commentary about what I read in the individual projects. In the end this seems like petty cash on steroids. 4.- They published the 2009, 2010 balance sheets, but not 2008. Why? They may be unable to come up with it! It’s all confusing and I think I have examples that show it. So, yes, I think is all disorganized and since they never had to provide records, they dont have all of it. The question still is: Donde estan los reales? I agree with the theory they are in Cuba or spent on Chavez’ pet projects. Ramos says money into Fonden is about US$ 80 billion, he will have more to say soon, including this stuff. 2-I’m sorry you went at this right during my move: I would’ve loved to help you with some of the grunt work but this all happened while my life was an ocean of cardboard boxes. 3-It’s unfriggin’ believable how no two sets of numbers in the recent spate of disclosures seem to match up to one another. Do any of the Ministry-wide tallies in your Excel sheet at least match the Ministry-wide tallies in the Giordani Report to the A.N.? Or individual line-items? I may make a project out of that tomorrow. 4-In one of your earlier posts, you had a commenter (who seemed well dateado) saying that the underlying story here is that they hadn’t been publishing numbers not to hide something per se, but more because there is total chaos in Fonden’s accounting – no proper control system was ever set up, there’s no uniform reporting standards, zero auditing, etc. – to the point where even Chávez probably doesn’t have a truly reliable balance sheet available to him if he asks for it. I’m really starting to think there might be something to that theory. That’s how Petrocaribe works. They also get 60 days to pay half and a year grace sometimes. KINGSTOWN, St Vincent — Venezuela promised to help build the international airport being built in Argyle but does not owe St Vincent and the Grenadines anything, Prime Minister Dr Ralph Gonsalves said on Monday. Caracas is yet to repay Kingstown EC$8.78 million paid so far to Cuban workers on the airport, as part of Venezuela’s promised contribution to the project. Gonsalves, responding to an opposition question last week, told Parliament that Kingstown pays EC$368,572 per month in wages to the Cuban workers. He said on Monday that Venezuela’s promised contribution is not a debt to St Vincent and the Grenadines and thanked Caracas for its contribution to the development of the nation. The prime minister further said he was disappointed with media commentary on the situation. “The way some persons have carried the story and have commented is as though Venezuela owes us this money and they haven’t paid it and they should be traduced,” Gonsalves said. He said that when the opposition asks questions from “a mischievous standpoint”, Vincentians must “look at the factual matrix and see the extent of the generosity of the government of Venezuela to us”. Gonsalves said Caracas has donated to the airport project US$10 million in equipment, three wind stations, and had also partnered with Havana to set up a soil-testing laboratory. DID ANYBODY KNOW ABOUT THIS ONE??? He further said that the South American nation also agreed for Kingstown to borrow EC$27 million from the PetroCaribe Fund at 2 percent interest for 25 years — “a gift in practical terms”. He said thankfulness is part of Vincentian culture and that he will “rebut” ingratitude. Hey, $69B ± $29B, that’s spare change for the Robolucion, right? As A.J. put it, CAP was impeached for $17M. At that point the institutions were “sort of working” in Venezuela (and I was one who used to complain about it; little did I know then of what was coming…). That gives an idea of how complacent and apathetic Venezuelans have become with the status quo. No one should complain that the Robolucion destroyed Venezuela if/when it falls. We (all Venezuelans, myself included) let them. We, except for a few exceptions are simply watching on the sidelines how people “enchufados” with HC’s government do as they please. How do we know if any of the info in the Fonden website is true? Supposedly, about $38 billion were spent on some “projects.” How do we know if they really spent the money on those projects, or even if the money was spent on those projects? I mean, they DO have a credibility problem. Don’t they? That none of the opposition politicians mention this is very suspicious, to say the least. It could be that they have received a cut of the billions missing to keep up the “democracy” charade. This is a big reason why there are sooo many NINIS in Venezuela. Who do you trust? What OFAC knows that we don´t about Bernal and others? OFAC Claims that they are: “Foreign Narcotics Kingpig”……. For sure they will be “publicly recognized” by HC. I think he’s somewhere with Marcos Pérez Jiménez, laughing his head off, if there ever was a case of out of the frying pan into the fire Venezuela is it. Unfortunately most Venezuelans won’t’ care if its 29 Billion or a 100 billion, they think its Chavez’s money, the only thought in their heads is why he didn’t give them any, and how can they get their share, and that’s what Chavez is counting on, and you know he’s right. With all that’s wrong with the country hes still polling better numbers than Obama. I suspect that even Bernie Maddoff, sitting alone in his jail cell in New York, would be in awe of these numbers. 29/30 billion bucks missing? Really? How’d they do it? Just to put this into perspective…. That’s more money than the gold the Nazi’s buried in Lake Toplitz after the Second World War. That’s more money than Nicholas II stashed in Switzerland during World War I, a large chunk of the Romanov assets. (It was ‘almost’ handed over to woman claiming to be the Tsar’s daughter Anastasia.) That’s more money/gold contained in the 300 truck convoy of Gadaffi and Co, slowly making its way to Burkina Faso. Not to go overboard here, ….but that’s a lot of arepa’s! And CAP was removed from Presidency and jailed for 17 MM$… Which they couldn’t prove he stole, but handed for diferent purpose. They obviously are just so dumb they don’t realize what they are saying. That was a lot of work Miguel – good job. It just shows that no one has any idea whether these numbers have any relation to reality. ND.- De acuerdo con Jesse Chacón, director de la firma GIS XXI, en Venezuela existe un problema real de la inseguridad, que es magnificado por la estructura de medios privados que concentra 80% de la audiencia”. Explicó que “mientras que el índice de victimización de la inseguridad por parte del pueblo está en el orden 23%, el valor de la exposición mediática es de 68%”. The joke that just keeps giving. This post is brilliant and noble. Nonetheless, I don’t see any significant crusade to present this issue before public and institutional scrutiny (different from the work of few bloggers, newspapers, and few politicians). This is a very objective matter that potentially affects directly any major problems in Venezuela, including corruption, health system, police and prisons system, education, institutionalism, sovereignty, and national debt. This must be massively presented by each serious politician and journalist, addressed with the fact that there is not Comptroller in charge. We must demand that each contract and audit for each of the project needs to be posted in the website. We must claim that without transparency there is no democracy and that in this particular case, the lack of transparency affects dramatically the future of each Venezuelan. I am trying, I am trying. The press is hopeless, the only guy really on top of it is Deputy Ramos, I have given him all my findings, he is looking into some data that he has and plans to come out soon again on the issue, let’s see what happens.